We live in a world where Riff Raff can make this claim. Does it matter whether he follows through on his Panther Album Series? 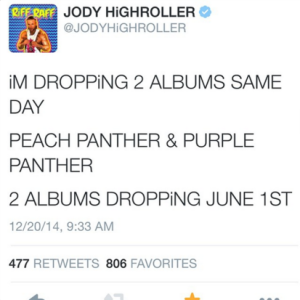 I personally would download any Riff Raff album or mixtape immediately post-drop, regardless of panther-color and regardless of when it happens. This is what truly matters in hip-hop nowadays: Internet buzz. Riff Raff isn’t exactly Rap Game King of Subtlety, but other artists are making an intricate art out of this style of dropping hints and building up buzz. These artists have to build up enough attention and rumors before “Has it Leaked?” declares that it has, in fact, leaked. We may not be far from an era in which we use social media statistics and analysis to concretely quantify an artist’s buzz. Without such a system of statistics, I have taken it upon myself to quantify the buzz surrounding some potential 2015 rap releases and measure them against the concrete quality of the hip-hop releases of January and February 2015.
Notable omissions from my list include If You’re Reading This It’s Too Late by the 6 God himself. My personal anti-Drake bias and the sheer omnipresence of the news of its surprise drop has left me unable to give it a fair chance. The aforementioned Riff Raff summer albums will also not appear, for as with his full-length debut, Neon Icon, I suspect there will be delays and red herrings. 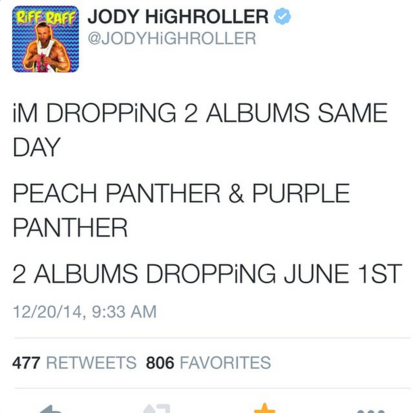 If Jody Highroller follows through on his promises, both albums could land in my year-end top-10. Big Sean’s Dark Sky Paradise also got a long look, but Big Sean’s music always requires a few listens before I accept the fun mindlessness. However, I’d highly recommend checking out “All Your Fault“, in which Sean’s braggadocio keeps up with Ye’s well-aging flow and soulful production. On to my pointless list! Living the Sremmlife is as easy as it looks. Have a great time. Don’t Flex in a No Flex Zone. Don’t Have a Type. Collaborate with the artists of the moment. The hits have been coming fast and furious for these Mississippi rappers. Mike WiLL Made-It’s party beats provided the perfect backdrop for Swae Lee and Slim Jimmy’s squealed-sung-rapped rallying cries to their compatriots in youth. The album is not one to revisit often, but it was never meant to be. The Sremmlife is all about living in the moment, and their moment at the end of 2014 and beginning of 2015 was immaculate. This Top-10 rating is not based upon current buzz. The news of Kid Cudi’s plans for this album was not earth-shattering. The last two releases from Cudi’s camp were well-made but divisive, and his departure from Kanye’s GOOD Music label was messy. Cudi made a name for himself with his introspective lyrics and rock-influenced beats, but those who are not diehard fans of this Cleveland, Ohio native have seemingly lost interest. However, his most successful albums to date, Man on the Moon 1 and 2 have a distinctive sound created by a stable of recognizable producers. For Man on the Moon 3, Cudi claims to be bringing A-Trak and Dot-Da-Genius into the booth, producers who could bring Cudi back to the charts. If the Brothers in Sremm are all about having as much fun as possible, Young Thug is about getting as weird as possible. Thugger is one of the most prolific rappers out there today. The intensity with which he unleashes his emotions on the mic can’t be matched. Working with southern rap kingpin T.I. seems to bring out the best in Thug. Even with the demise of Rich Gang and Cash Money Records, my excitement over the thought of an entire T.I., Young Thug collaborative album is enough to bump this nonexistent album up to 8 on my list. Schoolboy is a cryptic guy. Unlike most of the hip-hop community, he plays his hand close to his chest, trying to make the best possible music for the fans that got him this far. He enjoys dropping hints on Twitter that send his followers into a frenzy. Oxymoron was my album of the summer 2014, but it was mired in label struggles and pushbacks. If his Twitter claims hold any weight, I have to believe he’s gunning for a far less compromising portrait of the West Coast rap scene. The production will be sleeker, the parties will be wilder, and the “yawks” will be louder. Even if he doesn’t break new ground, Schoolboy Q never makes bad rap music. I wrote that there review a while back. Early 2015 is a tough time to release an album, as America wakes up from our collective winter food/holiday coma. Joey’s strong showing on this album demonstrates incredible technical rapping skills and an encyclopedic knowledge of rap’s history. When strangeness and gimmicks reign supreme, it’s comforting to know there’s a spot at the table for rap purists. Boom-bap beat work from Statik Selektah is what really gives this album its staying power as a measuring stick for the rest of 2015’s releases. The album is dropping on March 24th, and I couldn’t be more ready. His strategy for building buzz has been a constant stream of music. The string of “Easy Rider,” “Actin’ Crazy,” and “Terry” is hard to top, with all three getting airplay on my WRVU show. The laidback rock-influenced beats contrast his Queens accent and intimidating appearance. Bronson’s lyrics might be too left-field to truly break into pop-music in 2015. However, his record will dominate the Internet’s music community for weeks after its release. His ear for high quality beats that all sound distinct ensures that it will be an engaging listen. The way Earl builds buzz amongst his fans is through silence and nonsense. His major label debut gave us a very personal peak into the struggles of a young adult who returned to the United States with lofty expectations. Depression, introspection, and personal struggles took center stage. It was a cathartic album that needed to happen before Earl could focus on honing his craft. A Spring tour passing through Nashville and hints at working with Vince Staples has me excited about where he wants to take his music. He’s determined to keep things as off-the-wall as when he first started with Odd Future, but I feel like he’s ready to put in the work to give his music a greater meaning. A rap fanbase that is increasingly looking for artists that stand out have to admire Earl’s aesthetics. He should be in for a big year. This performance. Can I say again: THIS PERFORMANCE. This song features the catchy hook of a Kanye song, the anti-establishment Yeezus vibes, the distinct UK grime influence, and the Watch the Throne-style excess. How much more can you want from a Kanye song? Only One, FourFiveSeconds, and Wolves all had to grow on me. The cold post-apocalyptic beats and raw emotion seem to indicate Kanye could be ready to drop his most controversial album since 2008’s 808’s and Heartbreaks. I think Kanye is building up buzz and attention the only way he knows how: aggressively. He wants the world watching when he proves once again that he’s always a solid 5 years ahead of the musical curve. At year’s end, there will be a heated debate as to who owned the year: Kendrick or Kanye. An analogy I’d use would be Miles Davis and Louis Armstrong in the world of jazz trumpet. Like Armstrong, Kanye brought a music style dominated by African-Americans to a thoroughly racially diverse crowd. His soul samples were like Armstrong’s warm inviting tone, bringing all fans of music together to celebrate artistry. However, each needed an adventurous, more aggressive voice to point out the inequities amongst the diversified crowd. The cold harsh tone of Miles Davis cuts like Kendrick’s message in The Blacker the Berry. The parallel between this song and the Grammy-winning “i” demonstrates that Kendrick has something entirely new up his sleeve. He’s creating an album that’s as frantic and tense as our country at the moment. He also knows how to let go of these tensions and enjoy the parties his songs can create. Kanye will make an album for Kanye and Kanye’s fans. Kendrick will make an album that the people and the hip-hop world need desperately. If he can sustain these lofty goals for a full-length project, he will deserve this #1 spot, and I believe K-Dot will follow through.